Molly Chesworth and George Parker in Teddy at the Pomegranate Theatre, Chesterfield, from March 5 to 10. Photo by Scott Rylander. Award-winning, punchy new musical Teddy races through the dark and damaged world of post-war London: a new Britain bombed to bits by the Blitz, belts tight with austerity, but ripe and ready for revolution. Teenagers Teddy and Josie are dressed head to toe in the latest threads and ready to hit London in 1956. So what if it’s pouring down with rain and someone wants them dead? A little trouble never stopped Ted from having a good time. Desperate times call for rock ‘n’ roll. 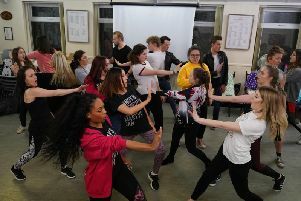 This story of teenage rebellion and the birth of a new musical era is heading for Chesterfield’s Pomegranate Theatre where it will be peformed from March 5 to 10. The performers will be accompanied by an on-stage band playing original numbers plus the biggest hits from the 1950s. Bursting with the energy of a live gig, this is theatre which have you jiving all the way home.